Nine-year-old Lexi Carollo, left, of Gloucester, pours English tea as her friend Anabell Iacono, 8, looks Thursday during a Girl Scout "Passport to Thinking" day at Kyrouz Auditorium in Gloucester City Hall. 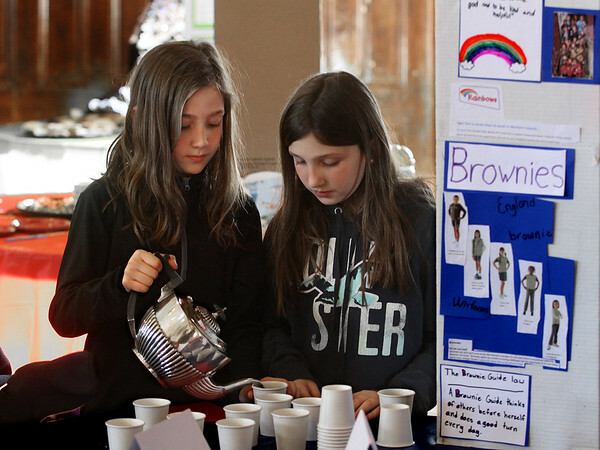 Girl Scouts from across Cape Ann participated in the event, designed to encourage the girls to think about Girl Scouts in other parts of the world. Lexi and Anabell's display was about Girl Scouts in Great Britain.